This is a photo of my dad after he was drafted into the Army in 1943 during World War II. 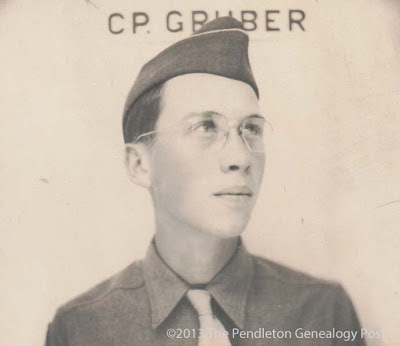 He was sent to Camp Gruber, Oklahoma, for basic training before shipping out to the war in Europe. He still looks wet behind the ears in this photo. I wrote about his war experiences in a previous post, A Wounded WWII Vet: Pfc. Albert S.Pendleton, Jr. (1925-2006). I can't get over how young he looks. Well, he was young. He was 18. Catherine, your dad does look very innocent, and amazes me that people so young fought World War II, but they did. I'm glad to see your dad's picture. My dad received his orders in June 1942. He was 30 years old by then, but in the pictures he looks almost as wet behind the ears as your dad. He left with the Army for Europe, and was in France and then England during the bombing. Now I'm going to read your previous post about how your dad got wounded. It amazes me, too, how young they all were. I forget that my dad was just 18 when he was drafted and 19 when he was wounded until I see the photos.